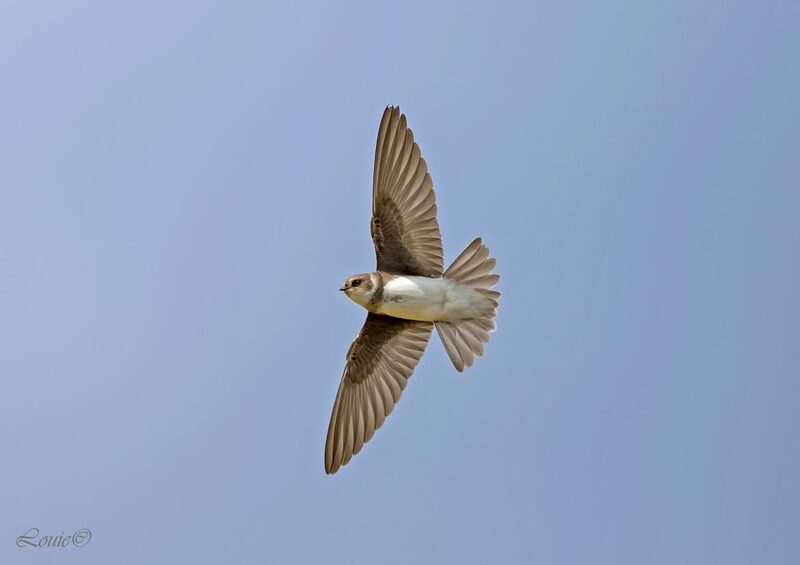 The sand martin (Riparia riparia) or European sand martin, bank swallow in the Americas, and collared sand martin in South Asia, is a migratory passerine bird in the swallow family. It has a wide range in summer, embracing practically the whole of Europe and the Mediterranean countries, part of northern Asia and also North America. It winters in eastern and southern Africa, South America and South Asia. The 12 cm (4.7 in) long sand martin is brown above, white below with a narrow brown band on the breast; the bill is black, the legs brown. The young have rufous tips to the coverts and margins to the secondaries. 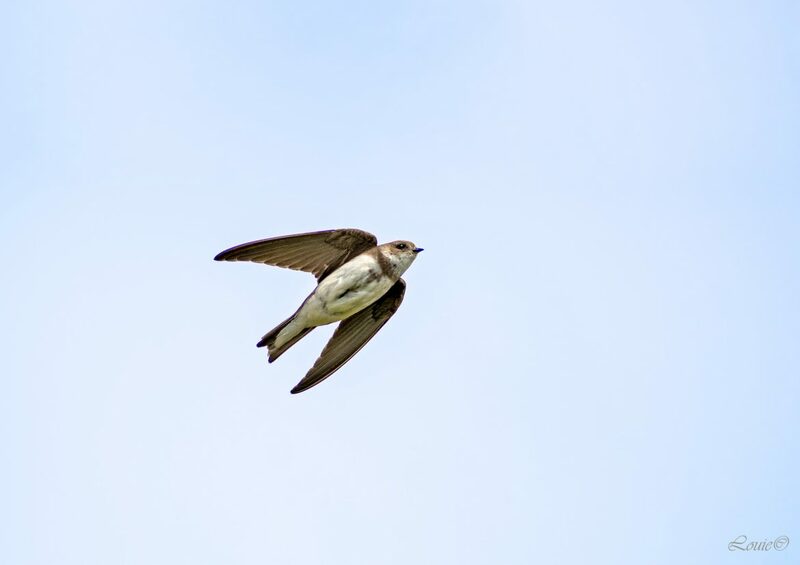 Its brown back, white throat, small size and quick jerky flight separate it at once from similar swallows, such as the common house martin (Delichon urbicum), the American cliff swallow (Petrochelidon pyrrhonota) or other species of Riparia. Only the banded martin (R. cincta) of sub-Saharan Africa is similar, but the sand martin only occurs there in (the northern) winter. 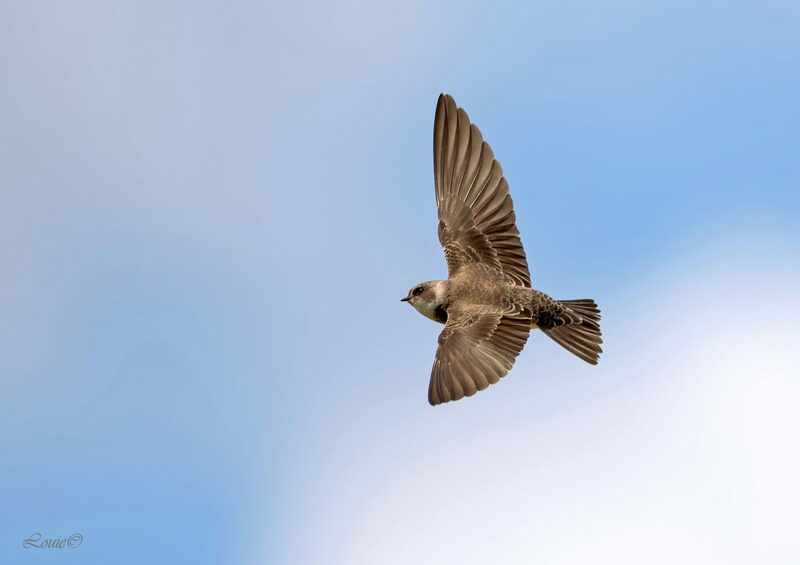 The sand martin's twittering song is continuous when the birds are on the wing and becomes a conversational undertone after they have settled in the roost. The harsh alarm is heard when a passing falcon, crow or other suspected predator requires combined action to drive it away. 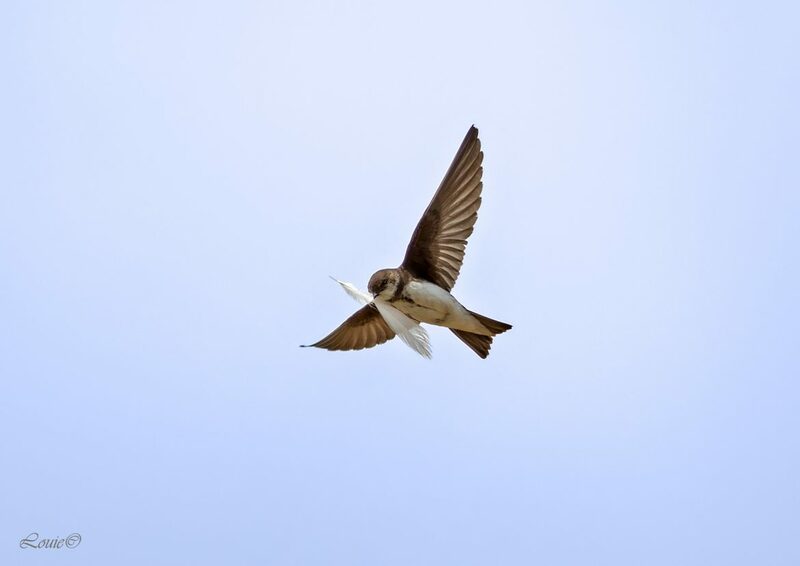 The sand martin appears on its breeding grounds as the first of its family, starting towards the end of March, just in advance of the barn swallow. In northern Ohio, they arrive in numbers by mid-April, about 10 days earlier than they did 100 years ago. At first, they flit over the larger bodies of water alone, in search of early flies. Later parties accompany other swallow species, but for a time, varying according to weather, the birds remain at these large waters and do not visit their nesting haunts. The sand martin departs early, at any rate from its more northerly haunts. In August, the gatherings at the nightly roost increase enormously, though the advent and departure of passage birds causes great irregularity in numbers. They are essentially gone from their breeding range by the end of September. The food consists of small insects, mostly gnats and other flies whose early stages are aquatic. 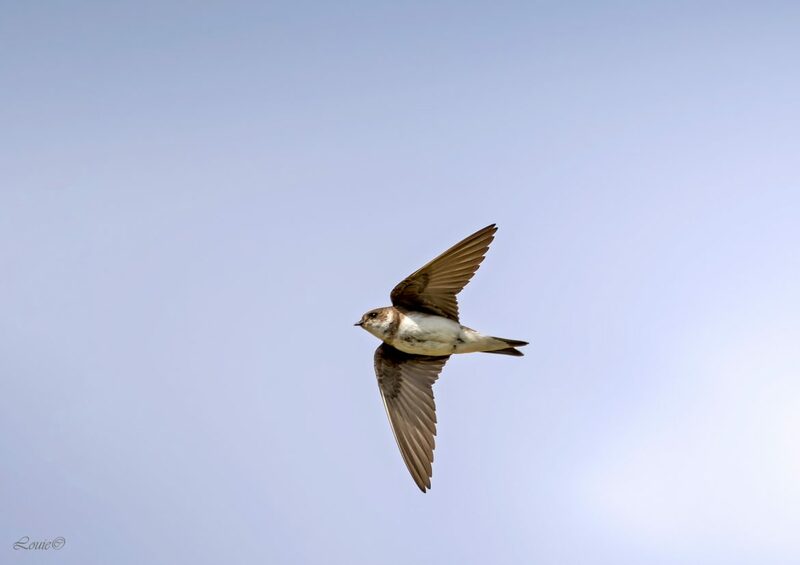 The sand martin is sociable in its nesting habits; from a dozen to many hundred pairs will nest close together, according to available space. The nests are at the end of tunnels of from a few inches to three or four feet in length, bored in sand or gravel. The actual nest is a litter of straw and feathers in a chamber at the end of the burrow; it soon becomes a hotbed of parasites. Four or five white eggs are laid about mid-late May, and a second brood is usual in all but the most northernly breeding sites. This is not a rare bird, and it is classified as a species of Least Concern by the IUCN. It does have some local protections, as certain populations have declined or face threats from habitat loss and fragmentation.